Facebook Player is the application to your Facebook page that will allow you to listen to your radio on the most popular social network in the world. 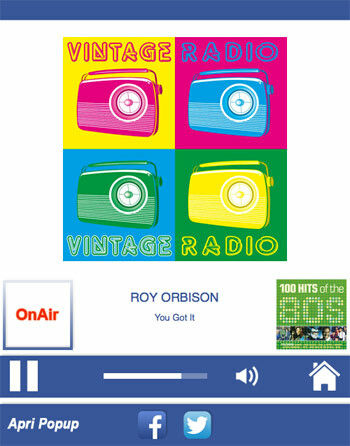 The Facebook Player app of Newradio is made and personalized with your logo and allows you to listen to your channel Shoutcast or Icecast directly on your Facebook page, allowing you to connect the facebook page with radio player application. Warning: You can enter Facebook Player exclusively on a public page or fanpage and can be snapped onto a group or a person’s profile. The player is compatible with all browsers. You can add the plug-in Channel Extra (€ 2 per month for each channel). You can customize graphic of the player (only on quote). X Facebook share link (if clicked on the user’s profile is published in the State cover of the song on the air or the logo of the radio with the words: I’m listening AUTHOR – TITLE RADIO XXXXX. Clicking on the state you are redirected to site of the radio). * Operation with the main stream in AAC + is guaranteed on all servers Shoutcast and Icecast 2 2. On Shoutcast 1 only if originating from our servers (Newradio).